The 10 Best Doughnut Shops in North Dakota! The doughnut has evolved over the years from a simple breakfast staple to an extravagant item that is virtually a meal itself. There is something about that fried dough that has endured over the decades, and it doesn’t appear to be going anywhere any time soon. 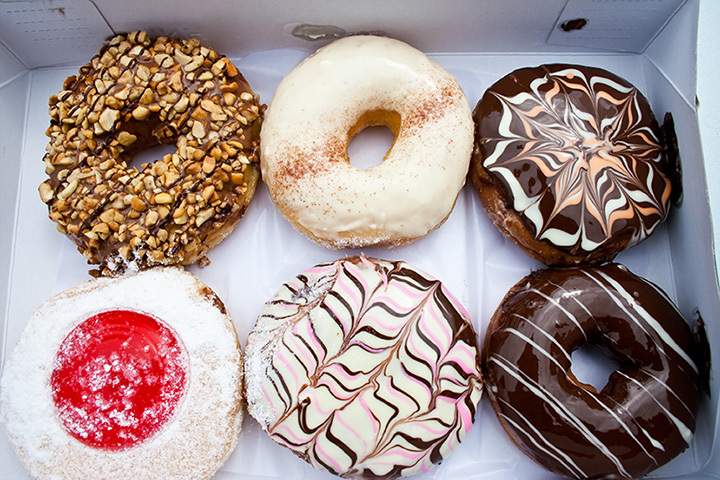 If you are craving something sweet, check out the following doughnut shops. It will be well worth your time. Sandy’s has been synonymous with doughnuts in the Red River Valley for almost 35 years. What started as a food truck quickly became the hottest doughnut shop in the area. Whether you are looking for a traditional glazed doughnut or something more creative like a maple bacon log john, Sandy’s has you covered. A locally owned business that prides itself on its extensive collection of doughnuts that are all made fresh daily. New combinations consistently appear, giving even the most loyal of customers reason to keep visiting. Feeling adventurous? Try their Tango Mango (mango filled topped with Tang). You will find a more traditional selection of doughnuts at GoGo, but don’t let that fool you into believing that you won’t find exactly what your sweet tooth is craving. All doughnuts are made fresh daily and can be paired with freshly ground coffee. A match made in heaven. If you grew up in the Dickinson area, you likely have many fond Donut Hole memories. An area staple for decades, the restaurant is still serving the best doughnuts around. They are known for their chocolate glaze that appears to be a tightly-held secret. Maybe you can unlock the mystery. Formerly known as Paradise Donuts, Sweet Rings continues to offer mouth-watering doughnuts and unique flavor combinations. From traditional offerings like bismarcks and long johns to what-were-they-thinking combinations that will have you rethinking everything you thought you knew about doughnuts, Sweet Rings has you covered. If you are looking for an elevated coffee and doughnut experience, Beans Coffee Bar is the place for you. Although the interior may be refined, don’t erroneously believe that they haven’t mastered the art of creating fried doughy goodness. Order their mini- doughnuts, available with either cinnamon and sugar or powdered sugar and you will never eat another doughnut. A small-town bakery that is far from small in flavor. If you are looking for homemade doughnuts like Grandma used to make, this is the place for you. The menu doesn’t include any wild flavor combinations, but when the traditional doughnuts are this good, it doesn’t need any. Although known for their cupcakes, their selection of doughnuts is worthy of a visit all on its own. In other words, a visit to Sweet Treats will satisfy all types of sweet tooth cravings. The cinnamon balls are a must have, if you can get past the cupcake bar that is. Don’t let the name fool you—it’s not all about the bagel at Broadway Bean. In fact, the restaurant has mastered the art of cooking just about everything. With a wide selection of food items that are perfect any time of the day, a visit to Broadway Bean will be well worth your time, especially if you are craving something sweet. A family owned bakery that has been making sweet tooths happy all over the Jamestown area for decades. You may not be able to find Captain Crunch coated or banana bacon doughnuts here, but you will find something delicious. Try their maple glazed doughnut, considered by many to be their very best.